The life of a grid communicator is a varied one, and a key skill is being able to react to new events and do what needs to be done, even if it is a bit strange! 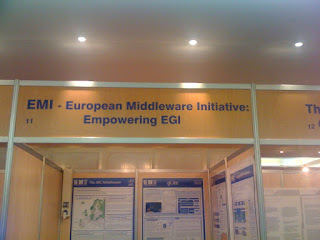 In this case, I am spending most of my time at the booth for EMI (The European Middleware Initiative), the proposed name for the companion project to EGI. 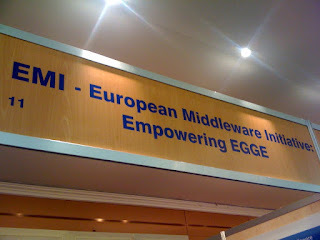 The name for the booth was intended to be: "EMI - European Middleware Initiative: Empowering EGI". Eagled-eyed readers may be able to see the issue I faced this morning. 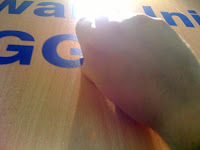 This is a fairly normal problem in a multi-lingual environment but it did require fixing, so I had to leap into action using my trusty skills with an impromptu ladder and a craft knife (kindly lent to us by fellow-blogger Vicky Huang). After a bit of peeling and impromptu modification of the letter E we were getting there, just needed to make it neat, or as neat as as possible when balanced on a chair. In the end, voila! All fixed, thereby making my own very small contribution to the future of European Middleware! More seriously though, in the Grid field we are always dealing with people from different countries, with different scientific and technical expertise and of course speaking different languages. One of the biggest successes of the Grid, aside from the technical developments, is the human network that underlies the Grid. This human network relies on being able to solve problems, whether they are technical, scientific or communicative, in a good humoured way. 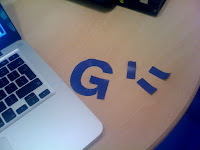 PS - if any of my fellow stands are in need of a letter G (slightly used) or a few small blue strips, please ask at the EMI stand! Good quick thinking and very funny post! Troubleshooting are we? 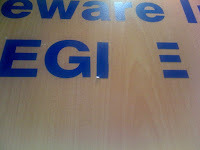 Not only was EGEE spelled EGGE but it was meant as Egi all along. Too many Es, Gs and Is.